I have been using air patrol for a few months now and I think I can give you by now a good review about it! I actually bought air patrol by coincidence; I was at Sephora searching for a new under eye concealer for a very dry under eye area and the girl working there suggested air patrol for me. So I said why not I like to try new things anyways! So I bought it as a concealer at first then I discovered it is actually an eye primer! 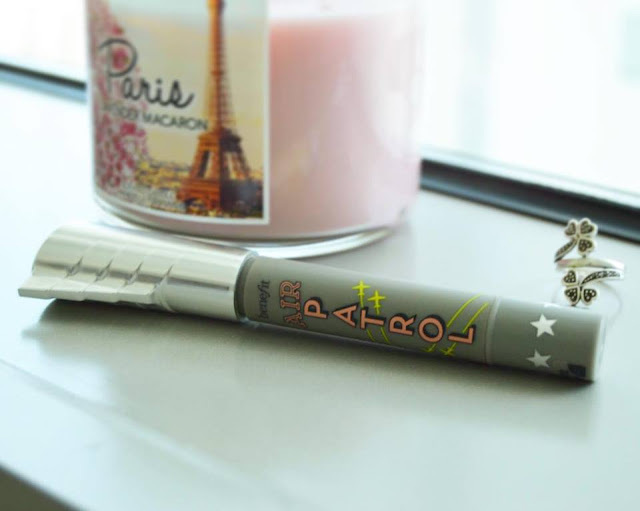 Air patrol BB cream eyelid primer with broad-spectrum SPF 20 claims to help guard delicate eyelids against sun, smoke and pollutants. It also claims to extend the wear of eyeshadow for long-lasting color. When I started using it I really like it. I noticed that it keeps eyeshadow from melting away and provides a smooth finish with no creasing. However, I didn’t notice any help with concealing wrinkles. The rubber tip was a little bit weird at first, but now it doesn’t bother me at all. I use my finger tip to apply it anyways. I only use 1 or 2 clicks for both eyes. I actually love the fact that it has SPF 20 so mainly I use it in the morning. I also like to use it when I go eyeshadow free, its shade gives natural looking color correction.